Poetry is hard. I never wanted to be a poet. I tried many times to not be a poet. I'd rather have been almost anything else. A train conductor, an astronaut, or even one of those guys who picks up the Port-o-Potties. The pay is better, and I bet the Port-o-Potty guy gets less dirty looks when he tells people what he does than when you tell someone you're a poet. Usually it's like you'd just kicked their dog. I stopped telling people I was a poet a long time ago. In real life, at least. In the cyberworld I can't see peoples' faces so once in a while I come out and admit to being a poet. 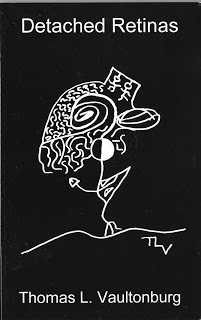 Detached Retinas is the book I launched Zombie Logic Press with in 1997. It is now one of the Midwest's oldest independent literary presses, publishing Outsider, Outlaw, surrealist and dada poetry. For every sale of this book on Ebay I make a donation to NAMI of Illinois to support services for the mentally ill.